The news that Duke University’s Fuqua School of Business has claimed the #1 spot in the Business Week MBA Ranking in 2014 will send shockwaves through the industry, and hopefully inspire other business schools to dream big. Established in 1969, Fuqua is one of the youngest leading business schools, and until this year the highest it ever ranked in Business Week was in 2000. Yale SOM is another big winner this year, climbing to #6 from the number 21 position two years ago – again the highest it has ever placed, and further evidence that school dean Ted Snyder will deliver on the goal of securing a regular place in the top 10 for Yale. Columbia Business School will no doubt be pleased with #5, surprisingly the first time the school has ever made the top 5 since. 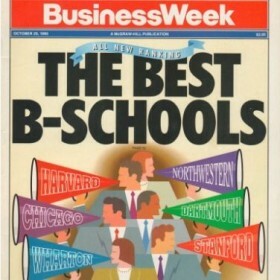 If anything the first quarter century of BusinessWeek rankings saw very little change among the top schools. As the historic table accompanying this article illustrates, until Duke grabbed the crown in 2014 only three business schools had ever held the #1 position – Kellogg (5 times), Chicago (4 times) and Wharton (4 times). And while 18 business schools have made the top 10 since 1988, only 3 had featured in the top 5 every year since the BusinessWeek ranking began – Wharton, Kellogg and Harvard. Such enduring success said a lot not only about the reputation of these schools, but also the quality of experience delivered over time, as reflected in the satisfaction levels of the student survey. But 2014 rings in the changes, notably for Harvard which tumbled 6 places to #8. This is not only it’s lowest ranking in BusinessWeek, but it’s lowest position this year among the five major media rankings. Much of this is due to the student survey, with BusinessWeek citing the role played by ‘the perception that the school caters to elites while neglecting women and minorities.’ It seems that even the mighty HBS might need to take a look in the mirror. Given the investment in time and money that an MBA represents, a strong showing in the BusinessWeek ranking and others provides comfort to the alumni who see the brand value of their degree rise. And UCLA Anderson, UNC Kenan-Flagler and Maryland Smith will all be hopeful that applicant numbers to their MBA programs will rise in the next two years on the back of these results. Indeed the admissions teams at Duke and Yale may need to start hiring very soon! Elsewhere there will be disappointment, as Cornell and Darden slip out of the top 10, but such is the nature of rankings. Beyond the learning lessons from opinions shared by recruiters and students, they can always point to their success in Forbes and The Economist. Which underlines the flaws and limitations inherent in any business school rankings. Each ranking uses a different methodology and weights the use of different data to produce their league tables, so it is important for candidates to understand what is being measured.